Charlie grew up in Clarksville, TN. He left to pursue a degree in Health and Human Performance at Bryan College. While studying, Charlie played four years of collegiate soccer. 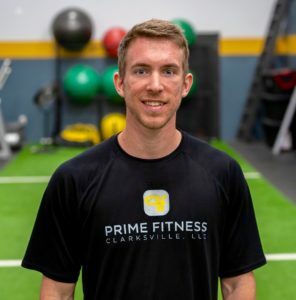 During his undergraduate work, Charlie served as an intern at Prime and found his heart and passions aligned with the those of Prime Fitness. He now serves as the full-time Training Director. Charlie is an intelligent coach who genuinely cares about the people he serves. In Charlie’s own words; “I am passionate about helping people improve their quality of living, and what is so cool about that is that it looks different for everyone!” His goal is to meet people where they are and encourage them into becoming the happiest, healthiest versions of themselves. When Charlie is not serving our members he is coaching soccer at Clarksville Academy, Developing young athletes as a coach at ACME Athletics, or spending time climbing, hiking with his friends and family. Vinny was born and raised in Clarksville Tennessee. Upon graduating from Rossview High School, he continued his football career in Indiana at Franklin College. Vinny later returned home to continue his education at Austin Peay State University where he earned a bachelor’s degree in Exercise Science. 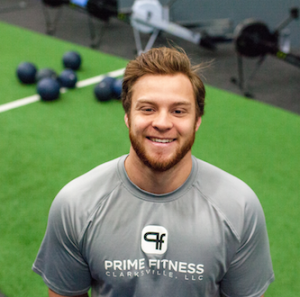 During his internship at Prime Fitness, Vinny realized his passion for helping people of all ages and backgrounds achieve their health and fitness goals. Vinny is a sharp and energetic coach who genuinely cares about the people he trains. He has also has a heart for working with young athletes and excels as one of Prime’s Athletic Development Coaches. If asked his purpose, Vinny would explain in his own words; “My main goal is to help individuals experience an abundant life and I really feel as if I can do that through the lens of health and wellness.” Vinny also serves as a volunteer Relevant leader in Grace Community Church’s youth ministry. He is rock solid, inside and out. Patrick Gargis, B.S., CPT, NASM-C.E.S. Patrick Gargis was born and raised in Muscle Shoals Alabama where he grew up in an athletic family; including an uncle who still holds a record as a quarterback at Auburn University. Growing up around sports encouraged Pat to pursue dreams of playing football, which brought him to Lambuth University in Jackson, TN. He later came to Austin Peay University to complete a degree in Health and Human Performance with a concentration in Exercise Science. Throughout his career as a football player, Pat has had to cope with different injuries. This caused him to spend a lot of time with different physical therapists and trainers learning how to treat and prevent injuries. 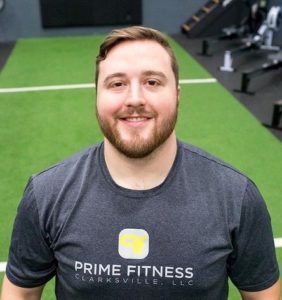 Patrick was in an internship at Prime Fitness during his senior year at Austin Peay when he discovered his love for helping people achieve their goals to improve their quality of life. He would tell you his favorite part about being a coach at prime is seeing the people he works with succeed. He says, “Victory is not in how difficult I can make a workout, but when I’ve had members come up to me to thank me because of how much weight they’ve lost or how they have improved their blood sugar levels after being diagnosed with diabetes or freedom from prescription medications for cholesterol or blood pressure. Even when someone says they can now keep up with their kids/grandkids then I feel like I’ve accomplished my goal.” When he’s not at prime Pat enjoys to play his guitar as well as go listen to music wherever he can, and loves fishing and doing other outdoor activities with friends. Katie was born and raised in Homer, Alaska, where she grew up playing competitive sports such as softball and volleyball. She also loved spending time outside hiking with her family. 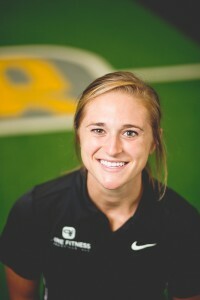 Katie completed a semester of pre-Athletic Training at Oregon State University in Corvallis, Oregon before transferring to Austin Peay State University where she graduated with a bachelor’s of science degree in Exercise Science. While finishing her degree at Austin Peay, Katie interned at Prime Fitness where she loved getting to help people work toward their personal fitness goals while also creating new friendships. 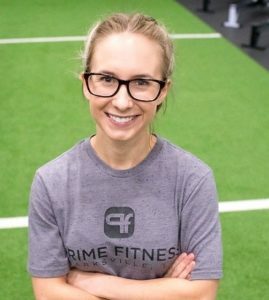 Katie says that watching people leave the gym with more physical and emotional energy than they had when they walked in is one of the best parts of being at Prime. She realizes that what she does at Prime reaches much farther than fitness goals. If Katie is not leading you through a strength training session you will likely see her saving the world at the front desk. When she isn’t at the gym, she’s most likely spending time with family, friends, or running around with her two little puppies.